Anyone who has been in the travel industry for even a moderate amount of time is used to hearing politicians talk about the importance of tourism to a country's economic health. Too often, however, strengthening the tourism industry is just a talking point, with little initiative behind it. It's rare that a politician actually takes action to support tourism — and it's virtually unheard of when that action includes ziplining over a jungle canopy. However, that's just part of what Mexico's President Felipe Calderon did in an effort to promote tourism to Mexico on a recent PBS show entitled, "Mexico: The Royal Tour." 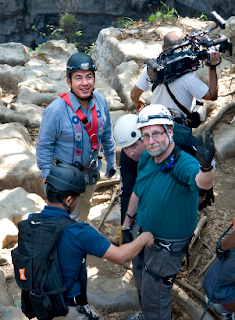 Accompanied by noted travel journalist Peter Greenberg, Calderon traveled to all corners of Mexico to show the world some of the amazing sights, activities and attractions that his country offers travelers. Last month, just before the show premiered on PBS, an audience of local and foreign dignitaries, along with local travel agents, joined President Calderon and Greenberg in Los Angeles for an exclusive sneak peek of the show. At the star-studded event — which also drew the likes of Russell Brand, Sharon Stone, Cindy Crawford, James Caan, George Lopez, Los Angeles Mayor Antonio Villaraigosa and others — President Calderon told the crowd that one of the reasons he accepted is because of the pride he feels in what his country has to offer the world. "I love my country very much. I have a passion for Mexico. And I know that there will be a different tomorrow for my people and tourism will be an important tool to do this," he said. "The best of Mexico is not its biodiversity, its beaches, its rainforests or its woods … It's Mexico's hospitality. Because when we say 'this is like your home,' we really mean that." During the course of "Mexico: The Royal Tour," President Calderon takes Greenberg all across Mexico. Together they visit Maya ruins, go scuba diving in an underground cenote in the Yucatan, go whale-watching in Baja, try spelunking in San Luis Potosi and more. The President even takes Greenburg to visit his mother in his hometown of Morelia. What the impact of "Mexico: The Royal Tour" will have on tourism to Mexico is anyone's guess. Certainly, however, Calderon has set a new standard for what it means to be politically active in the name of tourism. "Mexico: The Royal Tour" is being broadcast on many stations throughout the United States in both English and Spanish. Check your local listings to find a time and station near you.